One of my birthday traditions is to make a double-chili-cheese-burger pilgrimage to Marty’s Hamburger Stand in West LA … a little classic So Cal food shack tucked in between a fire station and a gas station. I have been frequenting this place since I was 15 years old … and somehow feel cheated that I didn’t know of this place during those preceding years. Yeah, it’s that good! And, every April 30th, it takes an event exceeding armageddon to stop me from my appointed rendezvous with two burger patties (medium rare), two slices of cheese, shredded lettuce, thick tomato slice, dollop of mayo, grilled onions and “a little extra chili”. Even the 1992 Los Angeles riots couldn’t keep me from burger bliss! This year was no exception, despite the 40+ mile trip and the nosebleed price of a gallon of gas. As usual, the first bite was nothing short of ecstasy, and the last bite pure sorrow that this gastronomic gala was coming to a precipitous end. Nonetheless, I left this oasis with what was left of my Orange Bang in my hand, and a huge chili-eatin’ grin on my face, and headed towards one of my other B-day customs … FISHING! 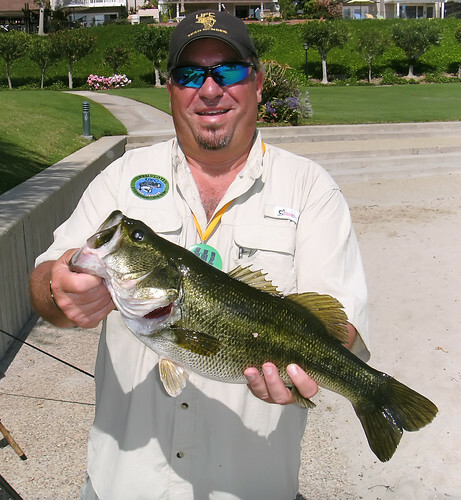 I met up with big fish guru Mark “Chief” Torrez at Westlake for 2.5 hours of birthday Bassin’. It was sunny, warm (80°), and clear with a slight breeze. We found a few bedders, but they were very reluctant to strike anything we offered, yet were very willing to blow up recently hatched fry that came too close to their lairs. Finally, Chief got things going with a nice 3.5 pound chunk on an 8″ swimbait (picture is on his camera). Not too much later I got on board when a Malibu-rigged 5″ Senko (194) got ticked on the drop of a “dinnertime” cast to a dock piling. When the line began to tighten, I dropped the hammer … BOOM! Had an extended fight and several aerials from this 4-14 battler. I farmed one other, a big bedding female on the hookset, before we decided to spend our last half hour on the other side of the lake. Soon after we got there, I had two nice fish flash on my Custom Cave jig but couldn’t connect. I switched back to the Senko and got a nice 3.5 pounder (no pic) to the net, and then had another pick-up and drop before I had to call it a day … a great birth-day! I said “Chula vista” to my fishing partner, but not before he bestowed several nice fishing goodies upon me for my big day. Always nice to receive gifts from a fellow angler … they just know exactly what to get you! 😉 Thanks, Chief! !